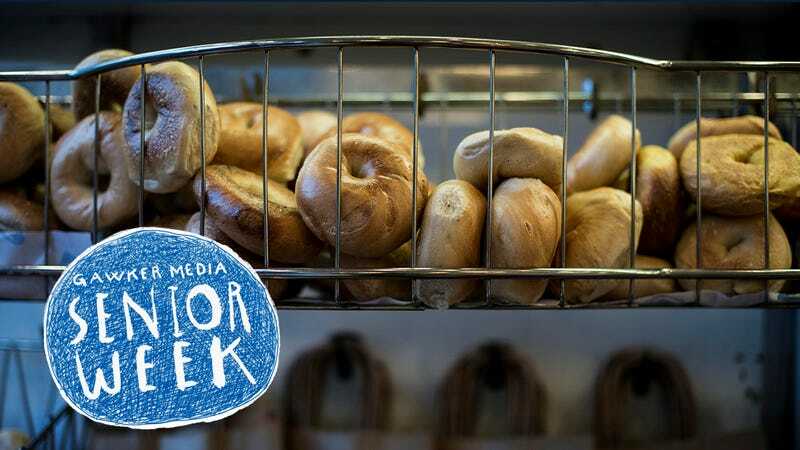 Like many people who live in New York and possess an enthusiastic appreciation for carbohydrates, I eat a lot of bagels. They are one of the things I will miss most about the city should I ever leave. I put them ahead of dollar slices, bodega cats, and free entertainment, like that time I saw the Winklevii on the subway. Imagine my delight, then, when I discovered that my neighborhood bagel spot, Bagel Pub, has its own app. In my mind, the benefits were immediately clear: I could pay someone to bring a bagel to my doorstep, and I could help support the little guy instead of ordering from Seamless. Sure, I could walk a few blocks south of my apartment and order in person, but I don’t really like moving, particularly while hungover, which happens to be best time to eat a bagel. And you know what? I’ve used it a few times now, and it lived up to these expectations. I will definitely keep ordering from this app. There are, however, a few downsides. There’s a $12 delivery minimum, which means I have to order a fancy juice, a coffee, and an expensive bagel to get my food. There’s also a horrible, minutes-long liminal period between an order placement and an order confirmation, when the screen simply says, “Your order isn’t confirmed yet.” I also think there might be a time restriction, because I tried to order lunch late in the afternoon once, and it didn’t work. But for certain occasions—when it’s pouring, when I am too hungover to lift my head off of the pillow, when I’m with another person, the entire month of February—this app is great. Good job, Bagel Pub. Also, when I was conducting research for this review, I discovered a famous cat named Bagel who has no eyelids, as well as something called a seaweed bagel. Congratulations to us all.